Is a Pancake Holster or Hybrid Holster Better For Carry? The two most popular styles of carry holster are the pancake and the hybrid holster designs. Which is better to carry with? The answer isn't clear as one might think. Each has features, benefits and drawbacks that the other may lack, just like the various designs of gun belts on the market. Pancake holsters are an enduring design for a fairly simple reason - they work. Essentially there are two pieces of material that are sewn together to make a flattish pouch, almost resembling a pancake of sorts. Up until the past few years, a pancake holster meant a leather holster. Today, pancake holsters can also be made out of molded Kydex or other plastic, and there are also a number of nylon or other durable cloth holsters as well. Pancake holsters, depending on the design, can be worn either outside or inside the waistband. 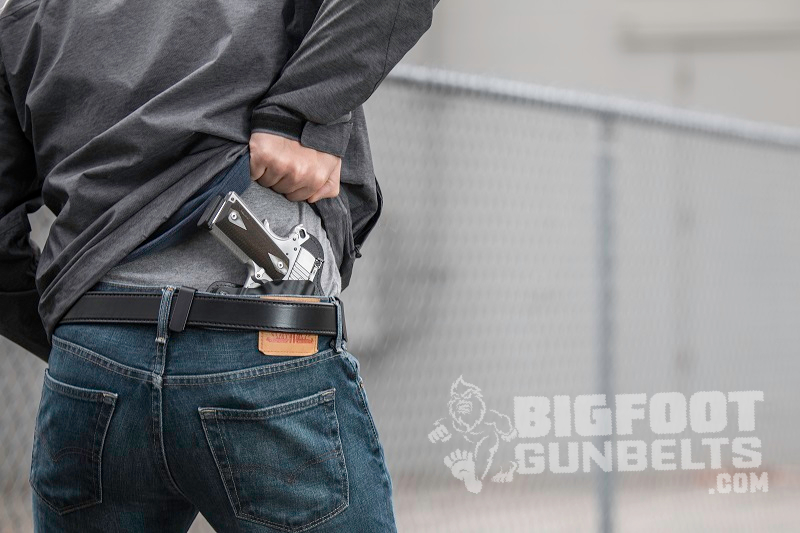 OWB pancake holsters can be either low or mid-riding for open carry or duty use, or can be high-riding for easy OWB concealed carry. Each has their benefits and drawbacks. Leather or cloth holsters may not be contoured to every nook and cranny of a pistol (or at all) and this may not provide the best overall fit nor retention. Some may be adjustable for retention, some may not. With that said, there are plenty of leather holsters that ARE made for a custom fit, though typically there is a premium to be paid. That said, a good number of pancake holsters come with a retention device such as a thumb break or other device to compensate. Additionally, much of the retention from leather pancake holsters comes tension from the gun belt, which stretches the holster to a degree and keeps it taut enough to retain the pistol. Kydex pancake holsters are precision-molded in most cases to fit specific firearms and usually are highly adjustable for retention. They aren't, however, the most comfortable for IWB carry. Additionally, IWB leather holsters can get a bit warm and sweaty during summer months, which not everyone appreciates. A more modern take on the gun holster is the hybrid holster. Just like the pancake holster, there are OWB and IWB versions, though the latter is much more common. Hybrid holsters marry a cloth backer of some sort to a plastic retention shell, usually custom-molded for the firearm that the user is carrying. The classic backing material is often a thick pad of leather, though many more have been devised. 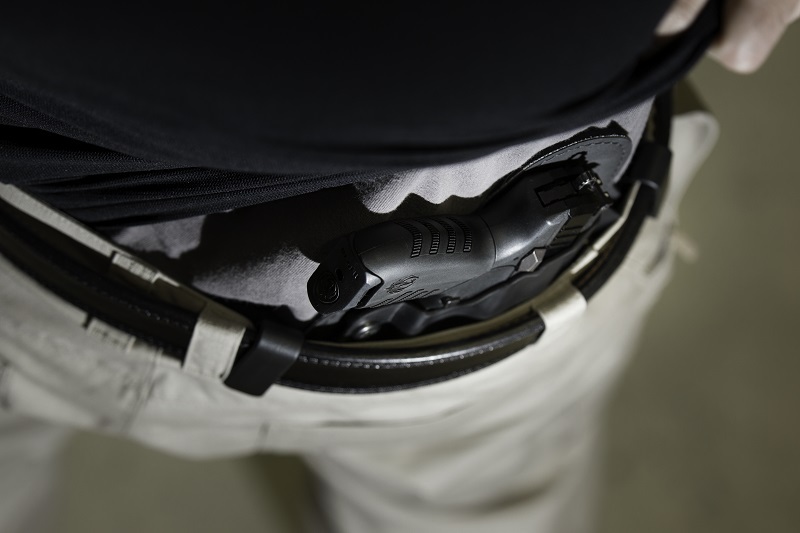 Neoprene is becoming very popular for hybrid holsters given it's comfort and the ability of some neoprene foams (especially the closed-cell variety) to repel moisture. Some companies develop proprietary multi-layer backer designs. 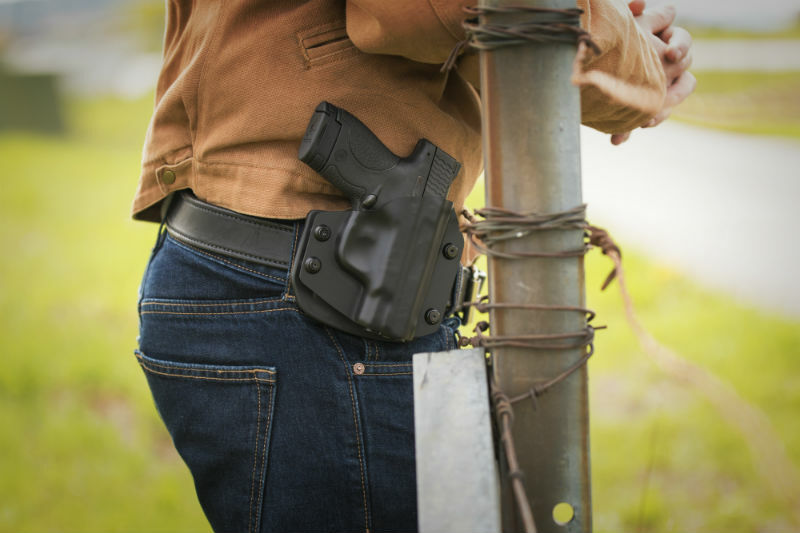 Hybrid holsters often will give a person a good fit, as the retention shell is custom-made for the gun it will hold. Gun holster retention, however, is another matter. Some hybrid holster designs have adjustable retention, so the wearer can set the retention shell how they wish. Others do not have adjustable retention. Some holster companies advise tightening up the shells by going over them with a hair dryer. Leather hybrid holsters, though, can be very "sweaty" during summer months, just as IWB leather holsters can be. Some prefer a different backing material for this reason. 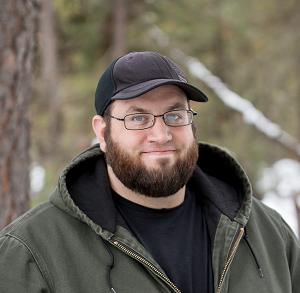 The truth is that any carry holster design is only as good as the company that makes it. There are pancake holsters out there that are fantastic. A custom leather pancake holster is not only beautiful, but will also work for a good long time. A quality Kydex pancake holster, so long as it doesn't break, will also give years of service. The same is true of hybrid holsters. Some are designed to last years and come with lifetime warranties in case of damage or manufacturing defects. As to whether you should get a pancake or a hybrid holster...the truth is that both are good designs. You will know a good holster is good by wearing it. A good holster will always be a good holster. Some people have both, dedicating a hybrid holster for summer wear and a leather pancake holster for winter wear. Look for companies with a reputation for making quality products or offering generous warranties. Trial periods are also a good thing to try to find; you can avoid the "holster drawer" that everyone acquires by getting refunds if a holster clearly isn't up to snuff. Ultimately, what works for you will be what works for you.